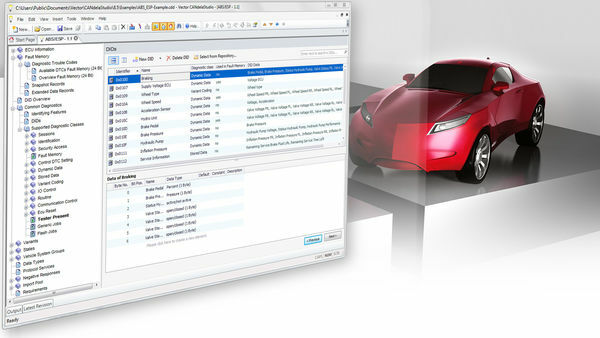 The specification tool CANdelaStudio is a central component of the Vector CANdela solution and supports users in creating and editing a formal vehicle ECU diagnostic specification. Data exchange regarding import from ODX (2.2, 2.0.1) and export to ODX (2.2, 2.1, 2.0.1) as well as the migration of diagnostic data to ODX is perfectly supported. The user is guided by a templates concept. Despite differences in requirements, the diagnostic data is always described in a similar structure, even for different automotive OEMs. This enables reusability across projects. Consistency checks during input assure high data quality. Diagnostics-oriented user interface assure quick results. In order to handle OEM-specific differences in a single tool, CANdelaStudio supports document templates. A document template corresponds to an OEM-specific diagnostic specification in content. It contains a formal description of all allowable basic services of the ECU and the set of mandatory content that must be implemented for every ECU. Document templates are provided by many automo-tive OEMs. Comparison view: Shows changes between two versions and saves the results. Many convenient filter, search and extended navigation functions are offered. Different views of diagnostic trouble codes: From a table-based overview to a view of the validity of DTCs in different variants and a detailed editing view for an individual DTC. Export function for generating the AUTOSAR Diagnostic Extract (DEXT files). The exported files correspond to the “Diagnostic Extract Template” standard of AUTOSAR 4.2.2/4.3.0. CANdelaStudio Standard offers all important functions to conveniently describe ECU diagnostics (e.g. ECU identification, fault memory, session, security, ...). Target group: All active participants in the diagnostic process should use CANdelaStudio Standard. The well-priced CANdelaStudio ViewX edition provides viewing, comparing and exporting of diagnostic data, but no editing. It has the same functionality as the View Edition, which is delivered with the Vector Tools (CANoe, CANape...) and can export the diagnostic specification as a requirement specification (RTF, HTML). Additionally, it features data oriented exports (ODX, CVS…), a compare view and an ODX Viewer. Target group: Authors of test sequences and users of test systems. Like CANdelaStudio Standard, additionally with manual and semi-automatic translation of the diagnostic specification into multiple languages (in the Standard Edition, you consistently edit the diagnostic specification in one language only). Furthermore, you can create and use dictionaries following the open TMX standard. Besides Western European languages, Far Eastern languages like Japanese are supported. Target group: International projects and projects where multilingual specifications are required or helpful. Furthermore, you can edit template aspects in CANdela documents (*.cdd) and translate templates (*.cddt). Target group: Users who are responsible for the global diag-nostic concept of a group of ECUs or vehicle model series.